Trust is incorporated in the year 1966 to take care of old age, weak, injured and deserted animals. 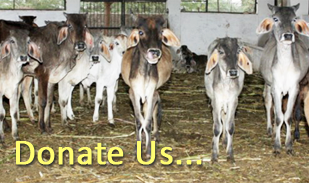 Trust is managing welfare of around 1000 animals, which even reaches 1500 in the time of draught like situations. Due to agricultural revolution, most of the activities on the filed are done by Tractors, due to which “Bulls” have lost their relevant for farmers. Lord Shankar had given name of “Pothiya” to Bull, but in today’s world, they are ignored and deserted. Kutchh district is known for irregular rains. Sometimes it has seen floods and some time draughts. Moreover, frequent small earthquakes keep trebling earth of Kutchh. Due to industrial revolution in Agriculture and Farming, Bulls have lost their religious as well as commercial relevance and people keep ignoring and even deserting them. Taking care of Old Age, Weak, Injured, Deserted, Ignored and sick animals. Trust gives Roti, Khichdi and Buttermilk to Stray Dogs two times a day in entire village. Our vision is a world where animals are treated with compassion and respect and where cruel factory farming practices end. Copyright © 2013. Shree Ratadia (Ganesh) Gaushala Panjrapol, All Rights Reserved.